Children, families and staff of Kountry Kids Care in Iowa began an initiative in April 2013 to reduce television time during child care hours and at home. This initiative was part of a reduced TV time grant opportunity through the Iowa Department of Public Health and Shelby County Public Health. Grant funding was used to supply the center and families with activities that could be used on a daily basis to promote mental and physical activity. Some of the items purchased were: board games, a croquet set, balls, a roller racer, stacking games, jump ropes, garden tools and activity cards. These items can be checked out by parents for use during family night activities instead of TV viewing. The last goal of this initiative was to plant a garden for the school-aged and preschool children. The garden has produced lettuce, pumpkins, melons, peppers, corn and green beans. 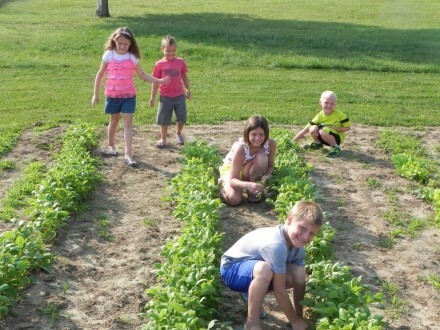 Children participate in the care of the garden and look forward to eating the fruits and vegetables of their labor as the garden begins to produce. By the end of the six week initiative, the director and staff decided to keep the “No TV/Technology Tuesday” initiative in place at the center. Several parents plan on keeping one night a week free of TV viewing. The parents found that everyone in the family benefits from less TV time. Results of the surveys indicated that this initiative helped reduce the amount of television viewed at home and promoted more physical activity. Children challenged parents to stay off their computers and cell phones and spend more time with them. Children have thoroughly enjoyed the alternate activities and have learned that life goes on just fine without television. The Farm to Preschool movement in Georgia has had some great projects and is on the cusp of hitting its stride. In 2015, partners from multiple agencies and non-profits began crafting the state’s first Farm to Preschool Strategy. This tip sheet is a great handout for parents. Includes quick tips on how to limit screen time at home and spend more quality time as a family.